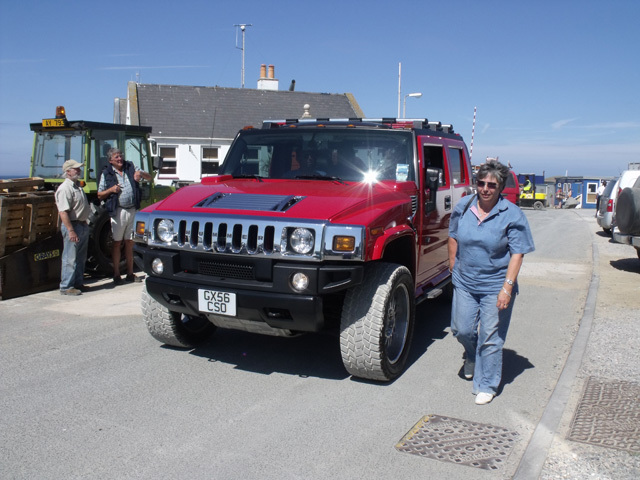 A Hummer has been imported to Alderney. Builder Mark Maurice took delivery of a red Hummer SUT on Thursday. The vehicle is five metres' long and has a six-litre engine. The importation appears to mark a major U-turn in States policy after Mr Maurice failed to gain approval for an almost identical vehicle last year. Mr Maurice's original application, for a white Hummer H2 Lux, was vetoed by former States chief executive David Jeremiah, despite the fact the car's specifications met various guidelines. Mr Maurice challenged the decision through the courts and spent £130,000 in the process. After his application for a judicial review failed last week, Mr Maurice said he would appeal and seek to import a different Hummer. The only difference in the second application is that Mr Maurice applied to use the vehicle for commercial, rather than personal, reasons. Mr Maurice has been advised not to speak to the media until his legal dispute is over. He did, however, pose for pictures at Braye Harbour. When asked why the second Hummer application had been successful, States chief executive Roy Burke said: "They are different applications - for different vehicle types. The rules governing the importation of varying categories of vehicle are different. Clearly it is not a matter of the colour."